“Learn how to become a plant doctor—No PhD required,” reads a blurb on the front cover. “If you can see it, you can fix it. Curing a sick plant just doesn’t get any easier,” reads a blurb on the back. More dumbing down of American gardening, a good Renegade Gardener might ask? Absolutely not. The one area of gardening that merits simplification and swift removal of myriad veils of mystery is diagnosing and correcting plant problems: diseases, pests, adverse plant culture predicaments, and erroneous gardening practices. What sets this book apart is its format. Part 1 (What’s Wrong?) is organized by plant part—leaf, stem, fruit, flower, etc., with color illustrations showing each plant part in some state of abnormality. Simple questions about the problem at the top of each page are linked, flow chart-fashion, allowing the reader to arrive quickly at the proper diagnosis. The flow chart pages are organized into chapters—Leaves and Leafy Vegetables; Flowers, Flower Buds, and Edible Flowers; Fruits and Vegetables; Stems, Trunks, and Branches, and so on. It’s brilliant. A ten-year-old could examine a plant exhibiting any possible problem, and by answering a few simple questions (sometimes following the prompts to a different page), work through the illustrations to arrive at the cause of the problem. I know that I am often reduced to a petulant ten-year-old when eyeing a plant that has something wrong with it, so the simplicity and genius of the flow chart format is most welcome. Once you arrive at the diagnosis, you are directed to the appropriate page(s) in Chapter 2 (How Do I Fix It?). Now the flow charts cease, and the solutions to your plant’s problem are presented in a smartly organized manner. Kudos to the authors for not only directing readers to first pursue true organic solutions (proper plant culture, soil amendments, correct watering habits) but also for not tripping up when offering solutions involving commercial fungicides and insecticides. They properly refer to organic products as organic chemical products (well, for the most part) and identify and illuminate each chemical found in these products with proper gravity (Page 209: “Avoid using chemicals, even organic ones, near bodies of water because many fish and shellfish can be harmed by them.”). One mild objection: The authors give copper-based organic chemical fungicides a bit of a free ride; these products have an environmental impact quotient of 30, which is off the charts, and I never recommend their use, particularly when numerous synthetic chemical fungicides are safer for the environment. But if that’s the worst I can crab, you know their treatment of chemical solutions, both organic and synthetic, is pretty much spot on. Part 3 (What Does It Look Like?) is many pages containing a large, impressive photo gallery of all the various leaf, stem, whole plant, fruit, flower and root problems that you would have arrived at working through the flow charts in Part 1. A flow chart may have already directed you to the pertinent photo in Part 3, to ensure that you have deduced the correct problem. I can’t explain it as simply as this wonderful book works. What you have here is a complete plant disease and pest diagnosis and remedy kit in book form, with a lot of good planting, maintenance and plant culture tips sprinkled throughout. 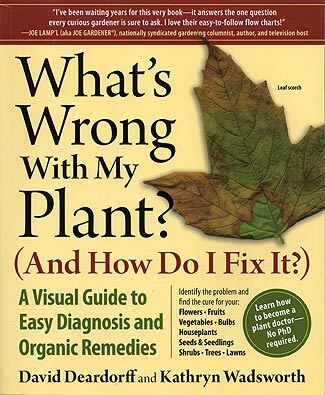 I’ve never seen a plant problem book this good, and it is heartily recommended.